Our wedding day had finally arrived! The day was heralded in with brilliant sunshine, minimal breezes and the promise of dreams fulfilled. The ceremony was scheduled for after breakfast when the dishes were washed and put away and everyone had a little free time. We didn’t want anyone to be left out. Two guests unexpectedly popped in just before breakfast and would join our little wedding party. Being in the wilderness has a lot of perks - no traffic noise other than the occasional airplane landing and taking off, no telephones ringing, no computer screens calling your name, no neighbors mowing their lawns at 6:30 on a Saturday morning - you know - all the things that we dare to escape on vacation. However, believe it or not, there are a few downsides to the wilderness - cold water bathing, sleeping on the hard ground if you’re on camp-out, keeping food away from the wildlife, and no hairdryers! I’m not one of the lucky that can wash their hair and let the wind blow it dry and look fabulous! And I wasn’t about to risk my looks on my wedding day. I had arranged for Otis to run a long extension cord to the large generator in the horse barn so I could plug in a travel hairdryer and look my best for my wedding. It was touch and go - as soon as I turned on the hairdryer, I could hear it surge up and down, but it held on long enough to finish the job. Mr. Squash and I finished dressing and walked over to the lodge to see if Otis and everyone else was ready. I walked in the door just to see Otis coming down from the loft in a clean pair of jeans, a starched clean shirt and blood all over the shirt collar! He was so nervous about his “preacher duties” that he had cut himself shaving and didn’t even know it. Teresa, knowing Otis well, had packed an extra shirt for him, so we were all set. 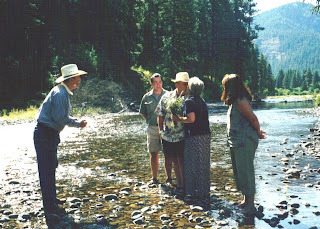 The wedding party gathered and began the walk down to the river. Passing the horse barn, Zeb and Teresa told us all to go on ahead, they would catch up with us in a few minutes. We got to the fence that separates the landing strip/pasture from the river. Otis held down the barbed wire so we could all easily climb over and we paused waiting for Zeb and Teresa to catch up. Mr. 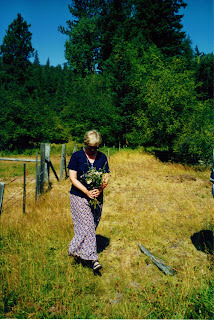 Squash and I were holding hands looking down river when I felt a tap on my shoulder, turned, and saw Zeb and Teresa holding the most gorgeous bouquet of wildflowers for me. I was stunned and couldn’t imagine where they found them so quickly! I was speechless and so very happy that they would do this for me. We all walked down to the spot we had picked out the day before while fishing. Bob and I stood flanked by Teresa and Don and Otis stood in front as our honored preacher. It wasn’t until that moment that we noticed the piece of tissue still stuck to Otis’ face where he had cut himself shaving. We politely said something to him, and the consensus was that he leave it there so there weren’t any more mishaps during the ceremony. We had a good laugh and Otis began. “Dearly beloved”.....he smacked his shirt pocket and what I can only describe next was the sound of a loud “whoopee cushion”. Stunned silence, then uproarious laughter. What the......? Otis didn’t want the ceremony to be a somber occasion – he wanted everyone smiling and laughing. In his own way, this was his solution to make everyone smile and laugh. Oh, boy we thought to ourselves, let’s hope this is the worst of it. The ceremony proceeded without a hitch. Otis was a fantastic first-time preacher. He even pronounced us Husband and Wife. Then he told Mr. Squash to kiss his bride, all the while forgetting the Native American Blessing! We let him read it and a huge sigh of relief was felt all around. Now if you think this is the end of our wilderness wedding story, you would be mistaken. There is lots more to tell. Stay tuned for Part 6….. This is a perfect setting. Loved hearing about your special day. My oldest daughter is engaged and getting married in October. THis is exactly the kind of scenery they want. What adorable pictures and such a memorable story - can't wait to hear the "rest of the story"
How sweet it was, I loved the wild flowers part! 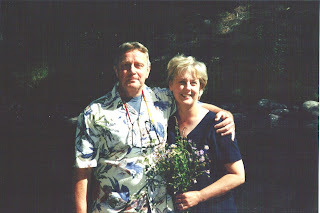 I've loved reading about your marriage to your sweetie, and such a beautiful setting. More...there's more??? Can't wait. How beautiful and perfect for the happy couple. And now he's Mr. Squash House. Oh candace....this is the highlight of my day. And Otis and the piece of toilet paper on his cut, I can see it in the picture! And you standing in the water and Mr. Squash in his hawaiian shirt. just priceless. This is the best and I can't wait for more. And yes, the wildflowers......so sweet! You were so pretty! Also the setting was beautiful too! I love it Candace! The surprise gift of wildflowers made my eyes a little misty and your photos are wonderful! I am so glad it isn't the end! Oh yay! there's more to the story. Beautiful pictures; what a nice place to hold a wedding. Me too! I'm so glad the story's not over yet. The scenery is awesome and you and Mr. Squash look sooooo cool. And they said this could only happen in the 60's. Ha! You showed em Candace. Did you keep or throw the bouquet? Oh , I am so glad there will be more, you looked so pretty and the setting, you were right, you both found the perfect place. Just wonderful, makes we want to cry, which is what I do at all Weddings. I am so happy for you! Nothing like a low stress wedding in the perfect setting! Candace you should write a novel, this is really quite an enjoyable read! Your wedding looks about as perfect as I can imagine a wedding to be. I'm so glad you have pictures! Oh my, what beautiful sunshine day you had! And, such a beautiful, natural bouquet! I just love this wedding story. I wanted to take the time to read it after I caught up reading other blogs. This is my last read and it was worth waiting for. Thanks for sharing pictures. I love that one where you are standing in the river. Look forward to part 6.